There is no debate that fitness and healthy well-being go hand in hand. The lighter the load in non-healthy ingredients, the more healthier one will be. Similarly, the less you have to remember and the least amount of maneuvering you have to do on a smartphone to be productive is optimal. So which is lighter and more productive of the BlackBerry Q10 (BBQ) or the iPhone5 (Apple)? 1). Multitasking windows. Both MAC and Microsoft have these capabilities in their operating systems installed on laptops and computers. The convenience of not having to close down an application and being able to leave off where you left is priceless. While iPhones have the capability of starting the app via maneuvering from the home screen, a new instance of the app is initiated which drains battery power. On the other hand, the BlackBerry Z and Q10 have active frames, which allows up to 8 apps to run at one time and remain in cache w/o impacting battery life. 2). Battery life. The average battery power for an iPhone w/o the hack battery charge cases that cost about $70.00 is very limiting for an executive that frequently gets emails and has to be on multiple conference calls during the day. The normal battery power I have experienced with my BlackBerry Q10 with no extra gadgets is about 19 hours after talking on 6 one-hour conference calls, checking voicemail and browsing the Internet for 3 hours nonstop in between text messages, tweeting, and posting updates to LinkedIn. But check out this article on all the things you have to do to increase battery life of the iPhone 5 (http://www.pcmag.com/article2/0,2817,2395808,00.asp). 3). Real-time email. The BlackBerry Hub is phenomenal by placing all the email, notification activity, settings alerts, calendar appointments, and requested social media interactions in one place. One stop shopping. But it also keeps them separate as well as with the traditional BlackBerry way. The iPhone keeps the email separate from all the other information on the phone. For corporate email, you have to use tools like Good to gain access. The calendar events have separate reminders, settings on iOS needs have separate notifications, each social media forum has its own process. In other words, maneuver through the entire phone to be updated or update. 4). Typing. The iPhone has the touch screen and and the visual keyboard that auto-corrects words you mean to say into words you have no intention on typing and vice versa. This means more time is spent correcting the autocorrections. And if you don't have skinny fingers like America's Top Model, mistakes will be made constantly. And now there's the Q10, physical QWERTY keyboard that allows the fat finger or extremely fast typer to keep the same productivity as if working on a laptop. Time savings and increased amount of work done. Winning! 5). Application development. It is pure marketing that Apple has allowed a barrage of applications to be available in the appStore. However for users that want applications that are not bound to one operating system, this is not a smart move. BlackBerry allows not only its native OS applications but also Android apps. More availability and scalability. 6). Security. Hacking an iPhone is really easy as there are many 'jailbroken' devices that exist so non-standard applications can be installed and Internet usage can be tracked and recorded of private information. Now there is even a charger that can hack the iPhone as well. The BlackBerry which has always prided itself on having the best security of all phones since incorporating into the corporate and government culture still has an airtight security that prevents hacking with everything being encrypted. 7). Documentation creation, review, and updates. The amount of applications I tried to make sure I had access to Word, Excel, PowerPoint documents on my iOS devices was crazy. Office HD and FilePro were the two closest ones but all the formatting is lost and updates to documents are extremely quirky. BlackBerry met the mark again making all Office applications available as well as easy accessible PDF documents. 8) Separate business and personal portfolio. If your company allows access to email on your iOS device, they have the right to see and control all data (personal and business). On the latest BlackBerry devices, Balance is introduced to separate personal use from corporate use. The device data, apps, and network access are separated so that you have a work space and a personal space. The separate spaces help you avoid activities such as accidentally copying work data into a personal app or displaying confidential work data. It is cool to have the latest gadget but Samsung's Galaxy is definitely outperforming the iPhone 5s today. 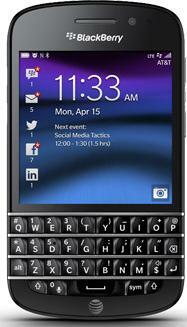 However the BlackBerry Z10 and Q10 have definitely redeemed the BlackBerry footprint. In the thought of less is more, less corrections more typing accuracy and less applications and maneuvering around the phone for more productivity. BBQ (BlackBerry Q10) wins over Apple!